Slate is among the most attractive and long-lasting of all roofing materials. Slate roofs are waterproof and fireproof, and a properly installed slate roof can last for 75-100 years or longer. Slate roofs are strong and durable, but they do not last forever. They should be inspected regularly, and repaired or replaced as needed by an experienced slate worker or contractor. 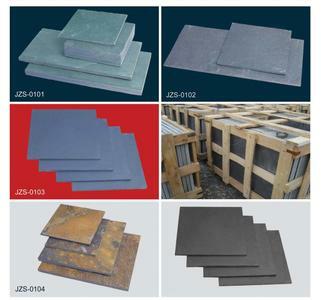 The four basic elements of slate roofs are: The slate, which should be a hard variety with a reputation for durability; the roof deck, which should be made of board (not laminated) at least 3/4 inch thick; fasteners, which can be copper, stainless steel, cut steel or hot-dipped, galvanised steel nails; and flashing or sheet metal joints in valleys and around vents, pipes,dormers, and chimneys. Problems with any of these components can result in a leaking or failing slate roof. The weakest component of a slate roof is often the flashing. Flashing on historic slate roofs is typically made of copper (sometimes lead coated), galvanised steel, lead sheet, or terne coated steel. These materials often deteriorate before the slate tile. If the flashing leaks, the roof leaks. Repairing flashing with tar or other sealants is not effective. Leaking flashing should be replaced, not repaired. The durability of a slate roof depends on the type of slate used. Some slates are harder than others. Though most slates should last well over 100 years, softer slates may begin to flake, crack and crumble after 50-60 years. Slate roofs cannot be repaired or restored after the slate has reached the end of its useful life. The entire roof should be replaced if more than 25 per cent of the slate tiles are damaged or deteriorated. Hard slate roofs can develop cracks and breaks over time. Slate is stone and some individual slate pieces may have tiny imperfections or fractures that are not evident at the time of installation. Environmental factors such as freeze-thaw cycles may eventually cause these slates to crack, break or fall off.